The study ISOL Navigator December 2015 is finalised. The 97-page study compares the attractiveness of different national markets and analyses the growth opportunities of 18 key countries: Argentina, Austria, Brazil, China, Chile, France, Greece, Germany, Italy, India, Mexico, Poland, Portugal, Spain, South Africa, Turkey, United Kingdom and the USA. ISOL Navigator includes 18 country portraits. A particular focus of the current study is the Forecast 2016: How do stakeholders think their business will develop across the 18 key solar thermal markets? The study analyses over 300 statements of stakeholders worldwide. You find further information about the content of ISOL Navigator December 2015 in the press release and in the info chart. 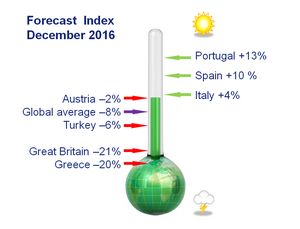 The ISOL Navigator is based on the ISOL Index, an international business climate index surveyed since the beginning of 2010. 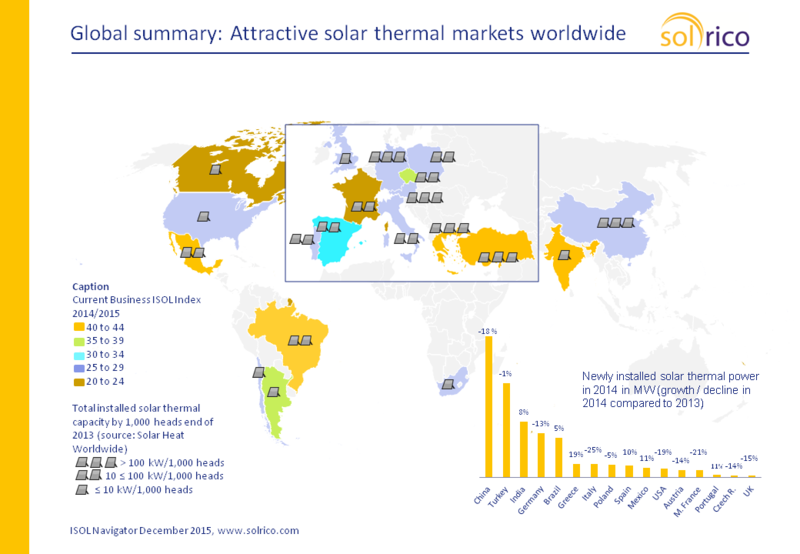 This ISOL index is a point-based indicator (ranging from 0 to 100 points) showing the satisfaction of solar thermal manufacturers and system suppliers with current and expected market development. Company values are averaged to obtain country and regional indices. Find further information about the ISOL Navigator on the publication list. You can also consult the Frequently Ask Questions. If you want to order the ISOL Navigator study please contact epp@solrico.com to receive an offer.